Lavender is a hardy perennial in the Lamiaciae, or mint, family. The herb is a Mediterranean native. There are many species of lavendula which vary somewhat in appearance and aromatic quality. English lavender, L. augustifolia, also known as true lavender, is commercially valuable in the perfume industry and is a mainstay of English country gardens. French lavender, L.stoechas, is the species most probably used in Roman times as a scenting agent in washing water. The species L. officinalis is the official species used in medicinal preparations, though all lavenders have medicinal properties in varying degrees. This fragrant, bushy shrub has been widely cultivated for its essential oil. The tiny, tubular, mauve-blue blossoms grow in whorls of six to ten flowers along square, angular stems and form a terminal spike. These flower spikes stretch upward beyond the 12-18 inch (3.6-5.4 m) height of the shrub, blooming from June to August. The blossoms are well liked by bees and a good source of honey. The needle-like, evergreen, downy leaves are a light, silver-gray. They are lanceolate, opposite, and sessile, and grow from a branched stem. The bark is gray and flaky. The herb thrives in full sun and poor soil. Ancient Greeks and Romans used lavender blossoms to scent bath water, a common use that gave the herb its name, derived from the Latin lavare, meaning to wash. 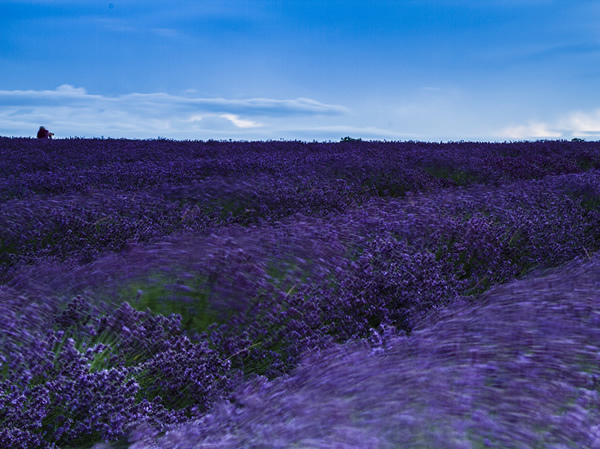 Lavender is best known and loved for its fragrance. The herb has been used since ancient times in perfumery. 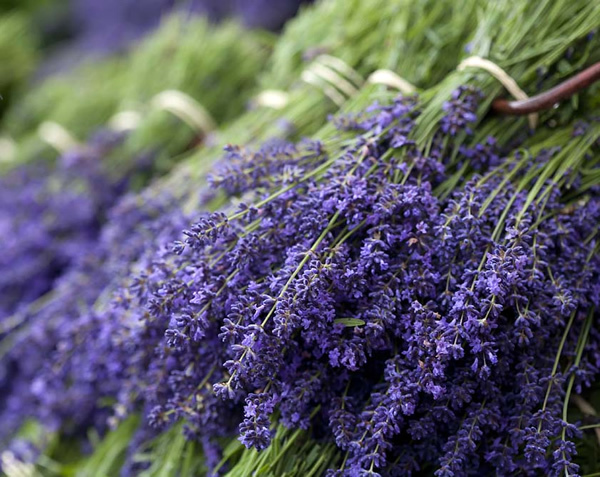 As an aromatic plant, lavender lifts the spirits and chases melancholy. Taking just a few whiffs of this sweetsmelling herb is said to dispel dizziness. Traditionally, women in labor clutched sprigs of lavender to bring added courage and strength to the task of childbearing. A decoction of the flower may be used as a feminine douche for leucorrhoea. The dried blossoms, sewn into sachets, may be used to repel moths and to scent clothing, or may be lit like incense to scent a room. Because of its fumigant properties, the herb was hung in the home to repel flies and mosquitoes, and strewn about to sanitize the floors. Lavender essential oil was a component of smelling salts in Victorian times. The essential oil of certain lavender species has a sedative, antispasmodic, and tranquilizing effect. Lavender has been long valued as a headache remedy. It can be taken in a mild infusion, or can be rubbed on the temples, or sniffed like smelling salts to provide relief from headaches caused by stress. Lavender oil is antiseptic, and has been used as a topical disinfectant for wounds. In high doses, it can kill many common bacteria such as typhoid, diphtheria, streptococcus, and pneumococcus, according to some research. The essential oil has also been used as a folk treatment for the bite of some venomous snakes. When used in hydrotherapy as part of an aromatic, Epsom salt bath, the essential oils of some species will soothe tired nerves and relieve the pain of neuralgia. They are also used topically on burns and have been shown to speed healing. It is also a fine addition to a foot bath for sore feet. Lavender essence makes a pleasant massage oil for kneading sore muscles and joints. Acting internally, lavender’s chemical properties increase the flow of bile into the intestines, relieving indigestion. Its carminative properties help expel intestinal gas. Lavender is an adjuvant and may be used in combination with other herbs to make a tonic cordial to strengthen the nervous system. A 2002 report from Korea showed that aromatherapy massage with lavender oil and tea tree oil on patients undergoing hemodialysis for kidney failure received relief from the itching the treatment often causes. The medicinal properties of lavender are extracted primarily from the oil glands in the leaf and blossom. The plant contains volatile oil, tannins, coumarins, flavonoids, and triterpenoids as active chemical components. These phytochemicals are the plant constituents responsible for the medicinal properties. 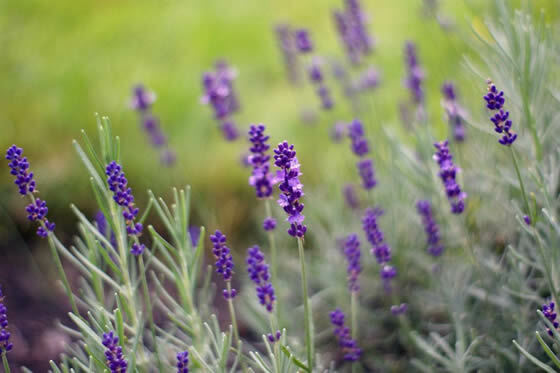 Lavender’s volatile oil is best when extracted from flowers picked before they reach maximum bloom and following a long period of hot and dry temperatures. The flower spikes dry quickly when spread on a mat in an airy place away from direct sun. Distilled oil: The essential oil of lavender is extracted by steam distillation. Just a few drops of this essential oil are effective for topical applications. Commercial distillations of this essential oil are readily available. Lavender tea: An infusion of the fresh or dried flowers and leaf can be made by pouring a pint of boiling water over one ounce of the dry leaf and flower, or two ounces fresh herb, in a non-metallic pot. It can be steeped (covered) for about ten minutes, strained and sweetened to taste. It should be drunk while still warm. Lavender tea may be taken throughout the day, a mouthful at a time, or warm, by the cup, up to three cups per day. Lavender works well in combination with other medicinal herbs in infusion. Lavender oil extract: In a glass container, one ounce of freshly harvested lavender flowers can be combined with 1-1/2 pints of olive oil, sufficient to cover the herb. It should be placed in a sunny windowsill for about three days and shaken daily. After three days, the mixture should be strained through muslin or cheesecloth. More fresh flowers should be added and the process repeated until the oil has the desired aromatic strength. 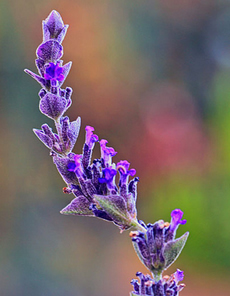 Lavender extract can be safely used internally to treat migraines, and nervous indigestion. A few drops on a sugar cube can speed headache relief. Externally, a small amount of lavender oil, rubbed on sore joints, can relieve rheumatism. The essential oil has also been used to minimize scar tissue when applied to burned skin. Lavender sachet: Dried lavender blossoms and leaves can be sewn into a small cloth bag to scent linens and deter insects. The bag may be placed beneath the pillow as an aromatherapy. Lavender vinegar: Fresh leaves and blossoms may be steeped in white vinegar for seven days, then strained and stored in a tightly capped bottle. Lavender has a long history of use as an essential oil and as a mildly sedative tea. When taken in moderation the tea is safe. It is important to note that, as with all essential oils, high or chronic doses of lavender essential oil are toxic to the kidney and liver. Infants are even more easily overdosed than adults. Interestingly, lavenderís relaxant effects were put to the test in a 2002 study on aromatherapyís effects on improved mental or physical performance. It seems that study subjects who smelled lavender actually did worse on mental tests than those who smelled nothing at all. So those choosing to use lavenderís soothing effects should perhaps choose the timing carefully. As an adjuvant, lavender can enhance the helpful properties of other herbs when used in combination. Lemon balm (Melissa officinalis) leaves can be combined with lavender as a headache infusion. For cramping, an infusion of lavender and valerian (Valeriana officinalis) makes a soothing tea. Lavender’s pleasant scent works well to cover disagreeable odors of other herbs in medicinal combinations. A tonic cordial can be made by combining fresh rosemary (Rosmarinus officinalis) leaves, cinnamon, nutmeg, and sandlewood with the lavender blossoms and steeping the mixture in brandy for about a week.